Heat oven to 400°F. Grease 12 regular-size muffin cups with shortening or line with paper baking cups. In large bowl, mix flour, sugar, baking powder, cinnamon, ginger and salt. Stir in pumpkin, oil, eggs, cranberries and pecans just until moistened. Divide batter evenly among muffin cups. Sprinkle coarse sugar evenly over batter in each cup. Bake 20 to 25 minutes or until toothpick inserted in center comes out clean. Remove muffins from pan to cooling rack. Serve warm. 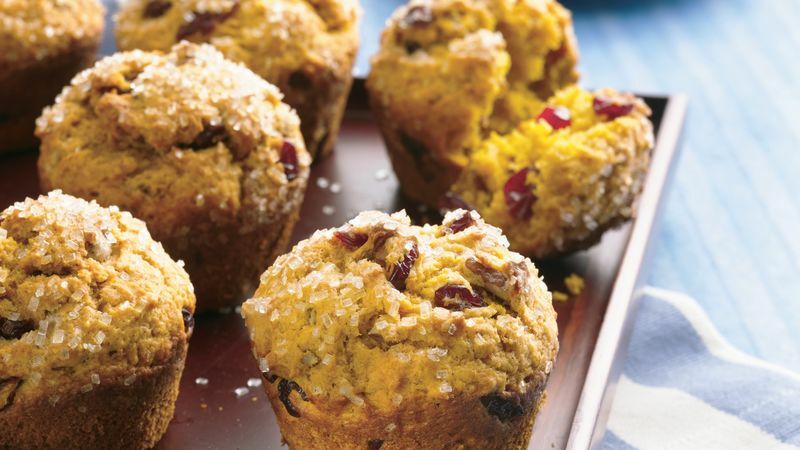 Try these muffins with dried cherries instead of cranberries. Take care not to overmix the batter. Overmixing can result in tough muffins with peaked tops and tunnels inside.